Personality: Sif is like every other woman in the nine realms; meaning her mood can change quickly. For the most part she is a kind person, thinking always of those she care about before herself; willing to even die for them in order to save them. She is full of love not only for her home; Asgard; but for adventure. This love for adventure at times leads her into trouble; see the events of following Thor to Joiunieim. Sif also has a little bit of an issue with being somewhat prideful; after all there are not to many female warriors on Asgard. As a child she really was the only girl for most of years she attended before going off to become a Shield Maiden. This fact brings up some resentment however; for though she is a proud and strong warrior, she does not care for the way most treat her so differently. After all she doesn't really fit in with the women at court nor does she fit fully in with the male warriors. While growing up Sif didn't seem to mind as much, now however she realized how different she truly is from others; she tries to hide these feelings and thoughts from others though truly thankful for the Warrior Three who seem to except her for who she is as well as Thor. Sif tends to wear her emotions on her sleeve, though she does her best to keep them in control unwilling to show weakness for fear of being thought less of. This however doesn't always work and sometimes her emotions does get the better of her, not that Sif is a weeping woman mostly when she is unable to control she will take it out on whatever foolish person is willing to enter the training ring to spar. Distinguishing Features: being a warrior means there will be scars from fights; which always leads to telling the story of it. However being pretty quick healer because of her Aesir blood Sif isn't plastered with scars, and the ones she does have are faint. Powers: Sif possesses all of the various superhuman attributes common among the Asgardians. Superhuman Strength: Like all Asgardians, Sif is superhumanly strong and possesses greater physical strength than the average Asgardian female. At her peak, Sif is able to lift about 30 tons. Superhuman Speed: Sif is capable of running and moving at speeds much greater than that of even the finest human athlete. Superhuman Stamina: Sif's musculature produces considerably less fatigue toxins during physical activity than the musculature of a human being. She can exert herself at peak capacity for about 24 hours before fatigue begins to impair her. Superhuman Durability: Sif's body is much more resistant to physical harm than the body of a human being. She is capable of withstanding great impact forces, exposure to temperature and pressure extremes, powerful energy blasts, and high caliber bullets without sustaining injury. Superhumanly Dense Tissue: Sif's bodily tissues have about 3 times the density as the bodily tissue of a human. As a result, Sif is actually much heavier than she appears. This increased tissue density also contributes somewhat to her physical strength. Superhuman Longevity: Like all Asgardians, Sif ages at a rate that is much slower than that of a human being. However, Asgardians aren't completely immune to aging, as some other god pantheons are. Regenerative Healing Factor: Despite her body's resistance, Sif can be injured like any other Asgardian. However, her metabolism enables her to rapidly regenerate damaged bodily tissue with greater speed and efficiency than a human being is capable of. Injuries such as slashes and punctures can fully heal within hours, whereas broken bones can heal within a few days. However, she isn't able to regenerate severed limbs or missing organs. Instant Teleportation: Sif has, by birthright, the power to transverse time and space, and travel faster than the speed of thought by piercing the fabrics of Infinity and travel to any destination she chooses. Sif can also use her enchanted sword to teleport herself to other dimensions beside Earth and Asgard. Weapons: Sif wields a special sword enchanted by Odin to enable her to "cleave" passageways between dimensions (primarily Asgard and Earth) by a special pattern of swinging motions. She also carries a shield that hold another blade in the top that can be used to attach to her other sword in order to make it into spear. Sif was born a second generation goddess of Asgard, her parentage unrevealed. As a child, she had golden hair and was an occasional playmate of Thor and his half-brother Loki. Once, while she was still an adolescent, Loki decided to play a trick on her in retaliation for her preference of Thor's company over his. As she slept, Loki cut off all of her golden hair. When she discovered the misdeed, Sif alarmed the entire capital city of Asgard with her cries of dismay. Loki, knowing he would be blamed for the trick, hurried to the kingdom of the Trolls to bargain with them to forge some artificial hair of pure gold to give Sif as recompense. The Trolls agreed to his terms and set about making the hair, secretly preparing it in the event that Loki tried to renege on his side of the bargain. Loki indeed stole the hair without paying for it, and presented it to Sif. Placed on her head, the gold hair began to grow as if it were natural, shinier than before. However, because the Trolls did not have a chance to treat it with a special potion before Loki stole it, the hair began to darken, finally becoming ebony black. When Sif began to cry once more, her parents began to tire of her vanity and so sent her off to learn the arts of warfare as a Shield Maiden. When she returned to Asgard years later, accomplished in the ways of the warrior, she had grown to accept her black tresses. Odin, lord of Asgard, had long deemed Sif to be a fitting mate for his son Thor, heir to the throne. Thor and Sif had seen little of one another in the millennia since their childhood when Odin deemed it time for them to renew their acquaintance. So Sif was brought back to Asgard and soon climb the ranks to serve alongside Thor and the warrior three. Together the five friends have gotten into their share of trouble all in the name to try and bring piece to the nine realms. It was Sif that was the first willing to go to Odin and beg for Thor's return, and when it was found that Loki had taken Odin's place on the throne, she had been the one to convince the others to travel to Midgard to bring Thor back. However with their travel to midgard it also brought the destroyer sent by Loki to finally end Thor. 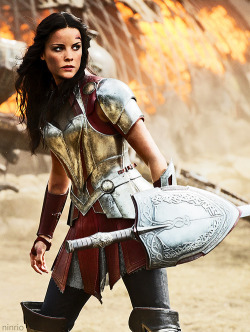 With the help of the Warrior Three, Lady Sif did all she could in order to protect the mortals which also included Thor and his new friends; willing to give her own life. In the end it would Thor's willing to sacrifice his life that would bring back not only his power but put an end to the Destroyer. Sif has loved Thor since they where children, though she had not been aware of it until recently. She had yet to relieve it to him however because she knows of his feelings for the mortal Jane. Lately the nine realms have been in a state of unrest and it has fallen to Sif like other Asgardian warriors to bring about peace. The Lady Sif looked down at the garden that spread before her bedroom balcony. It was a beautiful sun set in Asgard, and their world was currently at peace. This meant that Sif was bored, for you could only work with a needle or practices with your sword so many times. Not that Sif was found of needle work, flower arrangement, or other domestic skills that many people believe a woman should be into. Truth was if you were a woman, but not a sorceress, there wasn't much for you than to be graceful and pretty to look at; though Sif was the exception. As she looked out at the sun set, she couldn't help but smile and be grateful for her life. Her parents had saw early on that she could have ended up being a vain and trouble woman; after Loki had cut off her golden hair. She had fretted over the loss of her golden locks so much that her parents decided to send her off to be trained as a warrior; for she had showed a gift at such an early age for fighting. Today she had to admit that she was grateful to her parents for their forethought, for she had found her place in this world of gods however nontraditional it sort of seamed. Training however was the only thing Sif was finding herself doing. Thor was once again on earth helping out the mortals that adored him, and with him gone it seemed as if adventure went with him. It wasn't just Sif that felt this but the warriors three that fought alongside her and Thor also felt this; and they just like her were becoming restless. It was as if at that moment her wish for adventure floated out into the land of Asgard and came true, for there came a loud crash from inside her chambers. Turning quickly, Sif saw three men rush into her room their swords drawn and ready for battle. Sif looked quickly around, for her sword was laying carelessly on her bed, spotting a floor length candle opera she picked it up and swung it around; causing the candles to go out. Holding it between her two hands she was able to stop the three swords, but had to take a few steps backward due to the weight of her attackers. With just the slight shift she was able to pull back one side of the candle opera, than quickly swinging it up ward to hit one of the attackers. With their attention off her for a second, Sif was able to dart away toward her sword. Picking up both the sword and shield Sif stood on her bed. "Come on and fight me if you dare." The three men charged at her, and using her shield and sword she was able to keep their blades off her skin. However they were pretty well matched for she was unable to land a blow. It would take a poor maid walking into the room to draw the fighting to close, for she couldn't help but gasp and complain how she had just made the bed. Sif laughing jumped off her bed and clapped her hand on Hogun's shoulder; for it had been the warriors three that had charged into the room to attack. Lately the four of them had taken to seeking up on each other in order to keep their skills ready and each other on their toes. "Tis a good fight, though next time I will not go so easy on you three." The four friends shared in the laugh and left the Lady Sif's chambers, with the maid still complaining loudly behind them. Wow! This is a brilliant App! Accepted!